Bloom Association » MSC caught up in a turmoil…again! MSC caught up in a turmoil…again! Many actors, including BLOOM, have launched the On The Hook campaign, which aims to prevent yet another downward slide by the Marine Stewardship Council (MSC). In particular, On The Hook denounces the MSC’s plan to renew the certification of the world’s largest tuna fishery in the Western Pacific: the PNA fishery. See cover story by The Guardian and visit the On The Hook website ! The point of contention is simple: this fishery targets two species of tuna (skipjack and yellowfin tuna) using a single gear: a purse seine. During the same trip, this purse seine can be used opportunistically on ‘free schools’ of tuna — the activity that is MSC-certified ­— or on schools formed around ‘fishing aggregating devices’ (FADs). This practice using FADs catches many sharks, turtles, juvenile tuna and other protected or sensitive species, making it unsustainable. Therefore, it would be totally absurd to only certify the part of the fishery that targets free schools, omitting the unsustainable part of the fishery. “Put it this way, the Soil Association certify a farm as being organic and pesticide free. It would not be credible for them to certify a certain field in farm whilst the rest of the farm uses unsustainable pesticides. That principle is the same for our fisheries” commented Richard Benyon, MP and former DEFRA fisheries minister. Beyond this ethical nonsense, there is no scientific definition of what constitutes a free school or a school associated with a FAD. This arbitrary distinction does not seem to trouble the MSC, as it is about to renew the certification of the PNA fishery in the coming weeks. On The Hook is a group of 26 actors from various sectors: NGOs (BLOOM, Blue Marine Foundation etc. ), retailers (Migros, Woolworth South Africa etc. ), elected officials and public figures (Richard Benyon, Hugh Fearnley-Whittingstall etc.) and academics. To launch its campaign, On The Hook formally asked the MSC to immediately suspend the certificate of the PNA fishery, but also to urgently consider the merit (or lack thereof) of certifying only part of the activities of the same fishery. Polling by Populus (see “To go further”) shows that consumers find the current practices of the PNA fishery unacceptable. 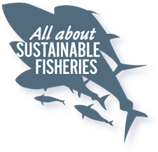 In the same questionnaire, 69% of the respondents agreed that any MSC-certified fishery must be sustainable as a whole. The survey allows us to conclude that a majority of the persons surveyed would lose confidence in the MSC should the PNA fishery’s certificate be renewed despite the FAD fishing activity. Since January 2017, many actors have been mobilized against the arbitrary distinction between free schools and FAD-associated. In a more general way, we have been mobilized against the separation between “sustainable” and “unsustainable” practices of the same fishery. A first letter from 21 signatories was sent by BLOOM on 13 January 2017 to ask the MSC to organize a public consultation on the subject, to suspend the ongoing assessment of the fisheries concerned, and not to suspend the current certificates until a decision was made. After a long and hard negotiation, a workshop was finally organized in early June by the MSC with some 40 stakeholders (including BLOOM). Following this workshop, our requests were not met since the MSC still does not want to suspend the assessment of the PNA fishery, but simply wants to ­— potentially — modify its standards in 2019. 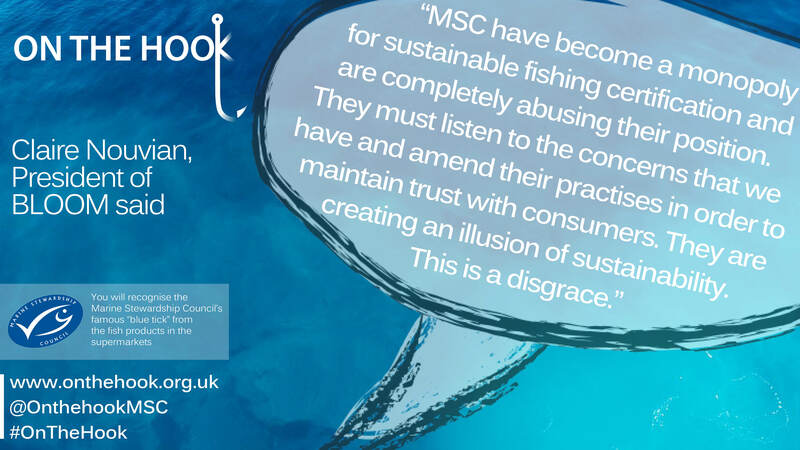 The MSC has just launched a new consultation (public this time), but still completely misses the point of the On The Hook campaign, preferring to talk about at-sea traceability. This consultation should feed into future decisions, of course, but it will in no way prevent the renewal (for a period of five years) of the PNA fishery. After trying to negotiate behind the curtain for more than eight months and then having received no response from the MSC board members, it is time to put this issue into the light. For several years, BLOOM has identified the proliferation of “sustainable fishing” labels as a barrier towards fisheries that generate jobs, respect the environment, and are ethical. We have contributed to public consultations, co-signed scientific papers, filed objections against dubious certifications. On our “misleading labels” webpage, you can find our contributions and learn more about the MSC and its unsustainable practices. A purse seine is a large vertical net used to encircle schools of tuna. A sliding system closes the net at the bottom, and the whole school gets trapped. Fishing aggregating devices are floating rafts equipped with various thins such as tarps, cables and nets to attract fish. These devices are regularly criticized for catching many juveniles and unwanted species, sometimes threatened. They can also create an “ecological trap” that leads schools of tuna to areas that are less adapted to their physiology. Purse-seine tuna fisheries around these devices now represents the majority of the five million tonnes of tuna caught every year (of which more than half of the stocks are overfished). Full list of members: NGOs (Animal Welfare Institute, BLOOM, Blue Marine Foundation, ClientEarth, David Suzuki Foundation, Ecology Action Centre, Fish Tales, The Island Conservation Society, Turtle Island Restoration Network), public figures and politicians (Hugh Fearnley-Whittingstall, MP Kerry McCarthy, MP Richard Benyon, MP Zac Goldsmith), retailers (World Wise Foods, American Tuna, Migros, Ocean Harvesters Operative, Woolworths South Africa) academics (Pr. Callum Roberts, University of York; Prof. Jennifer Jacquet, New York University; Prof. Megan Bailey, Dalhousie University; Prof. Michael Tlusty, University of Massachusetts; Thomas Appleby University of the West of England).